Whether you call her Chantilly or Tiffany, this cat kind of sounds like an extra from the movie Showgirls. But this kitty is all class. 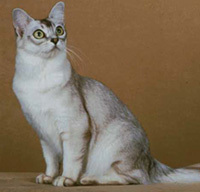 And frankly, hardly anyone calls her Tiffany anymore: European breeders were developing a similarly-named breed, so they decided to call this cat Chantilly instead. Whatever you want to call her, the Chantilly's striking good looks will take her far. But she's not just a pretty face: her chirpy voice lets her twitter like a songbird! This sweet girl is even-tempered and laid-back, which makes her a wonderful traveling companion and a perfect breed choice for the elderly or physically disabled. Some Chantillys can tend to be a little more anxious than others and may express this by overgrooming. WHAT IS THE CHANTILLY'S PERSONALITY LIKE? Your Chantilly will probably play favorites, selecting a family member or two as her special friends. They're friendly and social but not exhaustingly insistent about their need for affection. While these cats are more independent than some breeds, they are loving and loyal. They definitely crave your company. Chantillys can be shy with strangers, though. WHAT IS CHANTILLY'S BEHAVIOR LIKE? The Chantilly has a sweet, soft voice, and will chirp at you to tell you about her day. They are moderately active but not especially athletic. HOW CAN I KEEP MY CHANTILLY ENTERTAINED? Chantillys love anything that crinkles. Save the stiff plastic wrap from the next time someone sends you a gift basket, or let her bat around a crunchy paper bag. WHAT DO CHANTILLYS LOOK LIKE AND WHAT ARE THEIR GROOMING NEEDS? Chantillys were originally only brown-coated, but today come in many colors. That gorgeous coat is medium length and silky to the touch. Their eyes range from gold to yellow. Their hair is somewhat long and single-layered, which makes these beauties relatively easy to groom. WHAT HEALTH PROBLEMS DO CHANTILLYS HAVE? This is generally a healthy breed. Be sure to check your Chantilly's ears weekly for waxy build up and their digestive systems can be a bit sensitive, so be mindful about your feline friend's diet. If you notice a bald spot starting to develop, be sure to bring her to the vet. This may be a sign of stress-related over-grooming. ARE CHANTILLYS GOOD FOR PEOPLE WITH ALLERGIES? Chantillys aren't among the breeds generally recommended for allergy sufferers. Remember that no breed is 100% hypoallergenic, and any breed can aggravate allergies. You can reduce your furry friend's impact on your allergies with daily brushings. This will reduce pet dander and loose hair floating through the air you breathe and landing on your clothes and furniture. Bonus: think of the money you'll save on lint rollers. If your pet allergies are mild, a regular grooming session could have a big impact on your quality of life with your pet. WHAT IS MY CHANTILLY'S BEST DAY? SNUGGLES with their #1 person. But if you can find some of that crinkly cellophane left over from the Harry and David's basket your mom sent you, maybe leave some of that out on the floor. Joy is a Chantilly rolling in crinkle-film. SHOULD I ADOPT A CHANTILLY? Chantillys are a great choice for anyone seeking a moderately active cat who will love and snuggle them but not make a big production out of it. If you like a cat with a wiggle in her walk (but not ants in her pants)——this cat is what you'll like. Have you decided that a Chantilly is the purr-fect cat for you? Why not be your new best friend's hero and adopt a rescue! Be sure to check out our article on what to expect when you're adopting a dog or cat.